With their unassuming stubby bottles and endlessly adorable 'Hooray beer' ad campaign it's impossible to not like the Red Stripe brand. But packaging and marketing do not a beer make. How's the stuff on the inside of the bottle that is branded as the Jamaican beer? I suppose that Red Stripe must be categorized as a light lager. It certainly is not a Pilsner and 'Jamaican lager' is not a style category recognized by anyone I know of, so 'light lager' it is. Red Stripe pours with a dead-on appearance of the style. It's color is that of light straw and it's very clear although with fewer bubbles than other representatives of the style. The head rises white with a medium density and falls rather quickly. Red Stripe's aroma is grainy sweet with just a hint of sweet apples. Its flavor follows suit with a generally nondescript sweetness and a healthy carbonation sting on the tongue. Around the middle of the drink, some hops peek through then quickly scuttle away as a lingering sweetness hangs in the mouth. The beer has a full mouthfeel and a generally fuller flavor than most light lagers. Where is Red Stripe Brewed? It seems like a silly question, right? Red Stripe is, after all, a Jamaican beer and that would mean it's made in Jamaica. In reality, it depends on where you buy it and it's complicated. All Red Stripe was originally brewed by Desnoes & Geddes Limited in Kingston, Jamaica. In 2012, Diageo (then owners of Red Stripe) moved brewing of Red Stripe intended for the U.S. market to City Brewing Co. in La Crosse, Wisconsin, and Latrobe Brewing Company in Latrobe, Pennsylvania (home to Rolling Rock). Production of Red Stripe brewed for Jamaica, Brazil, Canada, and Europe stayed in Jamaica. 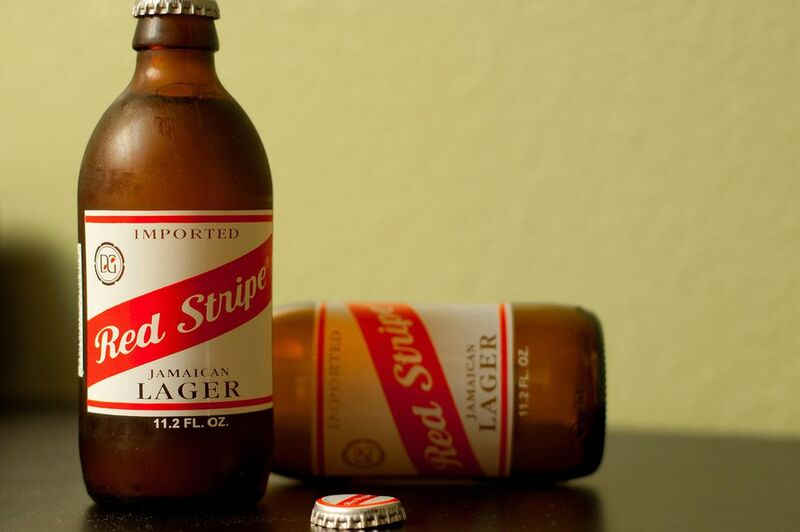 In 2015, two California people sued Diageo for misrepresenting that Red Stripe is a Jamaican beer. This despite the fact that the bottles noted the Pennsylvania brewery. In late 2015, Heineken USA purchased Red Stripe from Diageo. In 2016, the company released news that all brewing operations for the brand will return to Jamaica. Pale lager typically classified as an 'American Adjunct Lager' and made with Pilsen malt. Brand owned by Heineken USA. Red Stripe is not the only beer brewed on the island of Jamaica, it's just the best-known. If you're interested in exploring more Jamaican beers, look for these. Some are exported from the island and all can be found when you travel there. It is not a comprehensive list, but they are some of the best. Dragon Stout - The Caribbean island is, surprisingly, quite fond of stouts and if you are as well, try this dark ale. Guinness Foreign Extra Stout - Yes, a slight variation of the popular stout is also brewed in Jamaica. By most accounts, it's the best beer from the island. It is slightly sweeter and has more roasted notes than the Guinness shipped to the U.S.
Carib Lager is popular in Jamaica but is actually brewed in Trinidad and Tobago. It's a fantastic lager that's great for a day on the beach.